A fly-tying vise offering all the features of the Voyager vise with the added features of infinite angle positions and a heavier steel base for sturdier tying. The Voyager II is available in either clamp or pedestal base and comes complete with a bobbin hanger and a convenient travel pouch. 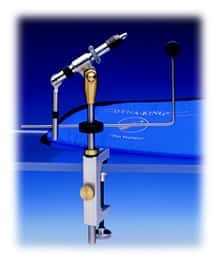 The simple functionality and the abilitiy to change tying angles to facilitate conventional or rotary tying make this moderatly priced vise appealing to many innovative tyers. A perfect traveling companion complete with a travel pouch. This vise offers 360 degree rotation, notch –lock cam, and designed to present a clear work area for the tier free of knobs. Available in pedestal or clamp.